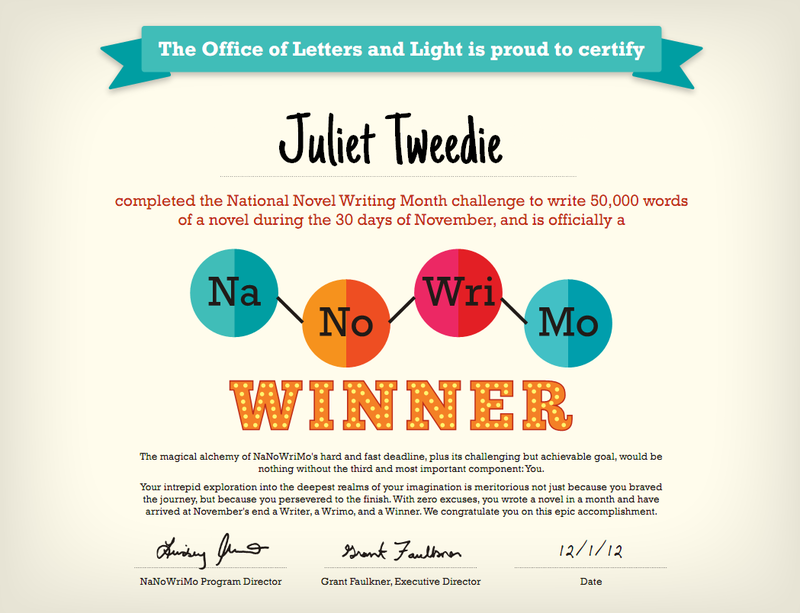 Ever So Juliet | Edinburgh lifestyle blog: Nanowrimo winner! During November I took part in National Novel Writing Month (see my previous posts here). The challenge was to write 50,000 words in one month - giving you (roughly) a first draft of a novel to work on. & I did it! (PHEW). This year I cheated a little bit by using nanowrimo to continue a novel I had already started (I wrote 10,000 words in the summer), which means I now have a first draft of 60,000 words. I'm writing a young adult book, so the word count is sort of about right, but I'm not going to worry about that too much until I'm through a couple more drafts! Now my next challenge is to KEEP GOING. One of the main reasons I like nanowrimo is that I really like working to targets and deadlines & they provide all sorts of fun word count widgets & graphs. I hated being behind, so I really pushed myself to write - even on days where I was tired, or lazy or just not in the mood. Now that I'm working off my own steam it's a bit harder - it's easier to go "ah, I'll just do it at the weekend", and fall back into lazy habits! So I think I am going to get a diary or something and tick off each day that I write, giving myself mini deadlines along the way. I am determined to keep writing - even if it's rubbish, I really enjoy it! I really wish I had the ideas/inspiration to write that many words. CONGRATS! Congratulations! I am so jealous! I start NaNoWriMo every year but I can never seem to finish it! Well done! I always want to do this but it was out of the question this year with a baby! I even have a great idea now but like you I know I'd never write off my own steam so I hope to do it next year! Good luck writing your book, I'll be sure to read it if you got it published! What an awesome achievement for 2012!